The cloud is just another word for the Internet. Cloud computing means storing and accessing data and programs over the Internet instead of your computer's hard drive. What cloud computing is not is hard drive storage. When you store data on or run programs from the hard drive, that's called local storage and computing. Everything you need is physically close to you, which means accessing your data is fast and easy, for that one computer, or others on the local network. For it to be considered "cloud computing," you need to access your data or your programs over the Internet, or at the very least, have that data synchronized with other information over the Web. In a big business, you may know all there is to know about what's on the other side of the connection; as an individual user, you may never have any idea what kind of massive data-processing is happening on the other end. The end result is the same: with an online connection, cloud computing can be done anywhere, anytime. There is an entirely different "cloud" when it comes to business. Some businesses choose to implement Software-as-a-Service (SaaS), where the business subscribes to an application it accesses over the Internet. (Think Salesforce.com.) There's also Platform-as-a-Service (PaaS), where a business can create its own custom applications for use by all in the company. And don't forget the mighty Infrastructure-as-a-Service (IaaS), where players like Amazon, Microsoft, Google, and Rackspace provide a backbone that can be "rented out" by other companies. (For example, Netflix provides services to you because it's a customer of the cloud-services at Amazon.) iDryclean is a good example of a Cleaners Cloud Computer system. You may have heard the term "The Cloud" and wondered what it is. Lets face it, us Drycleaners aren't computer experts are we. We just want to operate our business and hopefully have our computer be a benefit and not a distraction or a headache. One of the headaches we face with Computers in general is the regular tasks of backing up data, installing updates, and help with its operation. And that's probably a major reason why in today's automated world, drycleaners are one of the last businesses you will find that still operate without computers. If you do have a computer, you might have 3 or 4 different software programs that you use; Word processing, Accounting, Sign Makers, etc. and, of course, your Drycleaners Software program. On a regular basis you are bombarded with upgrade notices for each of them. To stay current you have to install the updates and worry about whether the new features will benefit you or if you will have to re-learn the whole program. Also, one of the most important things a drycleaner needs to do is backup the customer, accounts receivable and other important data on a regular basis. How often should you backup? Where should you keep a copy of that backup? What if your store burns down or your computer is stolen? All of these things are concens for a drycleaner. Legal Matters are also a giant headache. Starting in July 2010 all credit card companies are requiring your processing be compliant with the current rules and regulations. You might have to upgrade your stand-a-lone terminal hardware, if that is what you are using, resulting in several hundred dollars of unwanted and un-neccesary expenses. All of the above headaches are solved with Cloud Computing. But, how many headaches are added you might ask? First lets discuss exactly what Cloud Computing is and then we'll see how it effects Dry Cleaners and Laundries. Clouds are a set of mulitple computers that deliver software over the Internet. This allows a software environment that doesn't limit an application to a specific computer. Applications can grow dynamically and increase its share of resources on-demand as needed. So, when using a cloud, you can use as little, or as much, computing power as you need. The "Cloud" terminology comes from the picture that looks like a cloud when computer designers draw a picture of the internet. Here is a Cloud site for Drycleaner Software. So, a cloud is really the internet and the set of computers that support its operation. All of the above headaches are solved with Cloud Computing. But, what are the disadvantages you might ask? 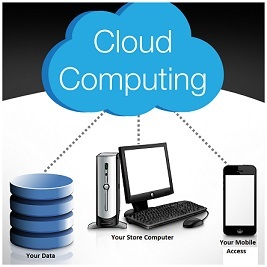 Lets look at the advantages and disadvantages of Cloud Computing as it effects Dry Cleaners and Laundries. You don't have to backup your data. Your programs are on the Cloud and are updated automatically. You no longer have to buy updates. Things like Credit Card Hardware updates are eliminated. If a computer breaks, simply attach another to the internet and startup again. You can gain secure access to your Drycleaning computer from work, home, or on the road. You will have to pay a monthly fee to a hosting or cloud provider. Pick a good provider to make sure your data is secure. Security breaches are possible (but unlikely). Less expensive software programs for Drycleaners. Increased internet speed, reliability, and lower cost. Our recommendation to customers is that Cloud Computing is worth a look see, if not now, then definately over the next year or two. Interested in Cloud Computing for Drycleaners and Laundries? Here is a site worth looking at.